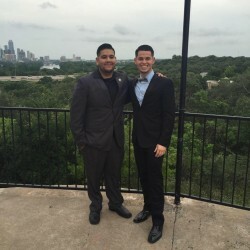 Welcome to the website of the CHI CHAPTER of OMEGA DELTA PHI FRATERNITY at The University of Texas at Austin. First and foremost, I want to express that it is a privilege and an honor to be able to serve as the president of Chi chapter for the 2015-2016 school year. I joined this brotherhood in Spring 2012 to be able to make a difference in, not only myself, but also in those around me. As a freshman coming into college, I wondered how college was going to be and if I would leave my mark on this campus. I searched around campus to find where I would fit in and where I could leave an everlasting impression. That turned out to be Omega Delta Phi. I saw gentlemen that came from similar backgrounds as myself and who had similar goals and aspirations as I had. I found men who had a passion for giving back to their community, and who worked hard to graduate from college. Every year since I’ve been apart of ODPhi, our chapter has completed well over 2,000 service hours as a whole and have earned the Presidential Service Award for doing so. I have also witnessed more than 30 brothers graduate from our campus. Some have continued their schooling and went on to medical or law school; while others have found jobs and are now making a difference in the real world. If it wasn’t for ODPhi I don’t know where I would be or what I would be doing while in college. I didn’t just find another organization that does service or hosts events; I found a family away from home that truly care about my well being and together we strive to make a difference on and off campus. As president for this upcoming year, I plan to increase our success with our brothers graduation rate and to make a bigger impact with our surrounding community. I encourage everyone to go out and search for that one club or organization that can help them leave their everlasting mark here at The University of Texas at Austin. However, if you want to do more than just leave your mark, if you want that family away from home and you don’t just want to join another traditional fraternity, I encourage you to look into our brotherhood. On paper we are a fraternity but in reality we are a brotherhood. Nothing can break our bond or love that we have for one another, and with that being said, I want to wish everyone success on the upcoming school year and as always, STAY HYPE!